Acquired by the National Art Museum of Catalonia, Barcelona 1932. Ref: 3902 MNAC. 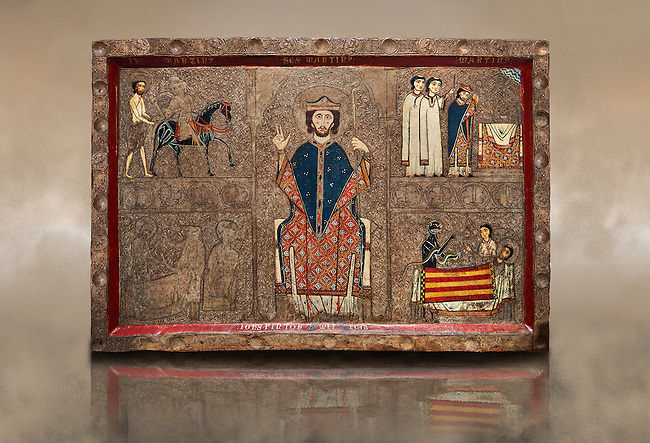 Romanesque painted altar front from Santa Maria Gia, Spain, showing Scenes from the life of Saint Martin. The exceptionally the bottom frame remains the signature of the author, a painter named John (Johannes). This work is typical of the Ribagorca style and incorporates early gothic compositional styles and narrative that subtly illuminates the faces. Also typical of the Ribagorca workshop are the decorated plaster reliefs on the entire surface of the front, which is covered with the characteristic gold leaf.